Old-style kopitiam (coffee shops) are a staple of the Malaysian culinary landscape. Despite the popularity of international coffee shop chains, there remains a segment of the population for whom dependably tasty food and good Malay-style kopi, friendly service, and honest, unfussy decor win out over generic beverages served in sleekly styled, air-conditioned comfort. I give thanks to these folks, for without them gems like Yut Kee - an old-fashioned kopitiam set smack dab in the middle of one of Kuala Lumpur's few remaining clusters of traditional shophouses - might have disappeared from the scene years ago. 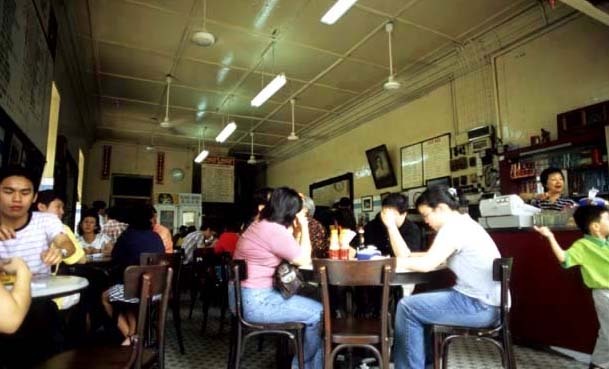 With all the physical hallmarks of a traditional Malaysian coffeeshop - tiles on the floor and running halfway up the walls, marble-topped tables and curve-backed wooden chairs, an ancient icebox anchoring a rear wall, ceiling fans - Yut Kee oozes nostalgia. But it's not staged; the place has been around for almost eighty years. Owner Jack Lee, who enthusiastically runs the shop with his wife and son, inherited the business from his father. An immigrant to Malaysia from China's Hainan island, Lee Senior spent the 1920s toiling in the personal kitchen of one of Kuala Lumpur's tin mining towkay (a Chinese honorific term for men of standing), eventually saving enough money to open Yut Kee in 1928. His photograph hangs on one of the shop's yellow-painted walls, and according to Jack, most of the coffeeshop's dishes are prepared from Lee Senior's original recipes. During the week elderly gents gather for gossip and coffee, and lunching ladies share tables with office workers from one of the nearby towers. On weekends it's mostly a family affair, as multiple generations sit elbow-to-elbow at Yut Kee's large round tables. Jack and wife Margaret seem to know every person in the room. Sweetly nostalgic surroundings aside, the number of dishes piled on each table suggests that Yut Kee's main draw is the food. The menu is vast, listing everything from noodles and fried rice to curries, and that curious holdover from colonial days, 'chop'. Chicken chop, lamb chop, beef chop, pork chop, fish chop - this plate of pan-fried protein doused with a thick gravy and served with potatoes, peas, and carrots, is one of Yut Kee's most popular items. But in three visits I've barely managed to get beyond the belacan fried rice. Miraculously devoid of grease, this fried rice boasts fluffy grains, crisp bean sprouts, non-mushy peas and nubs of carrot, as well as egg and pieces of smoky barbecqued pork; it's topped with a flurry of fried shallot (a seafood version adds small pieces of shrimp and squid). There's plenty of char in this dish, maybe eighty years' worth, and I suspect that's half its appeal. It's assertively fishy, extremely spicy, and completely addictive. 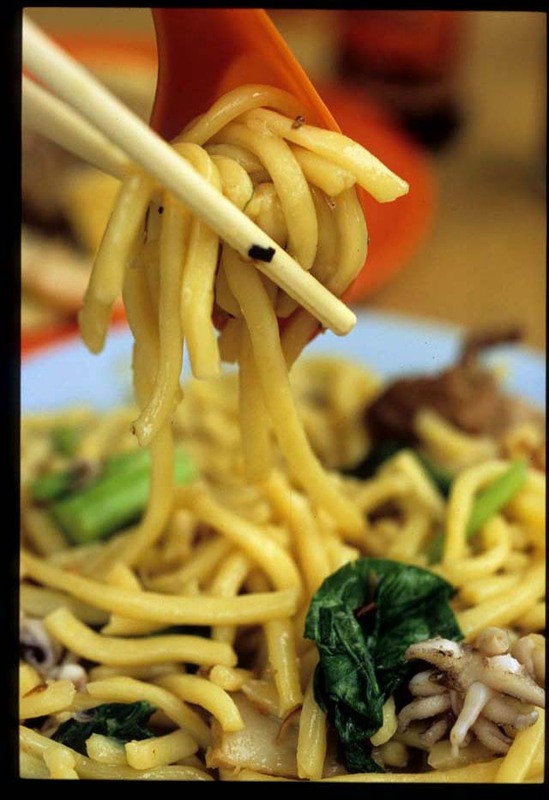 Hailam mee (Hainan noodles) boasts wonderfully chewy noodles, thick as the thin end of a chopstick, served wet, in a viscous broth or dry, in a light pool of soy and other seasonings. The latter, dotted with a few slices of pork, the odd bit of squid, and ribbons of choy sum, are a noodle lover's dream. Though slippery and hard to handle, they're well worth the effort. Roti babi (pork bread) is a Yut Kee specialty; trays and trays of this treat are stacked one on top of the other in a wheeled cart just inside the kitchen door. 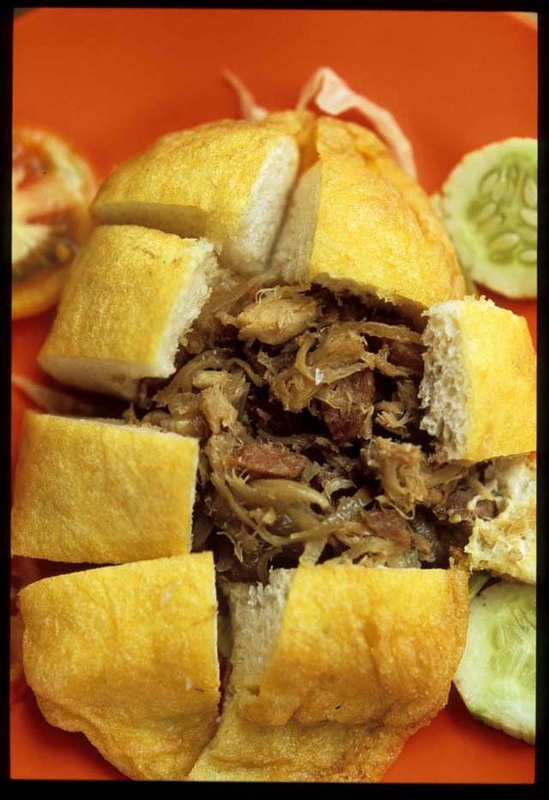 A small, puffy white loaf encloses a filling of succulent roast pork and onions. The flavorsome pig has been slow-cooked into shreds of porcine goodness, onions sauteed into silky caramel strands. The two make for a mouthwatering combo, spooned up on its own or eaten together with pieces of the light and fluffy bread. Other notable nibbles at Yut Kee include the fried mee sua (thin rice vermicelli with sliced napa cabbage and chunks of gizzard and squid) and a not-too-rich, fragrant, and surprisingly spicy chicken in red curry. A meal at Yut Kee isn't complete without a cup of Jack's strong coffee, brewed from a fragrant mix of Malaysian and Indonesian beans, and toast with butter and kaya (sinfully rich coconut 'jam') or a slice of kaya roll (soft sponge cake rolled around a kaya filling). 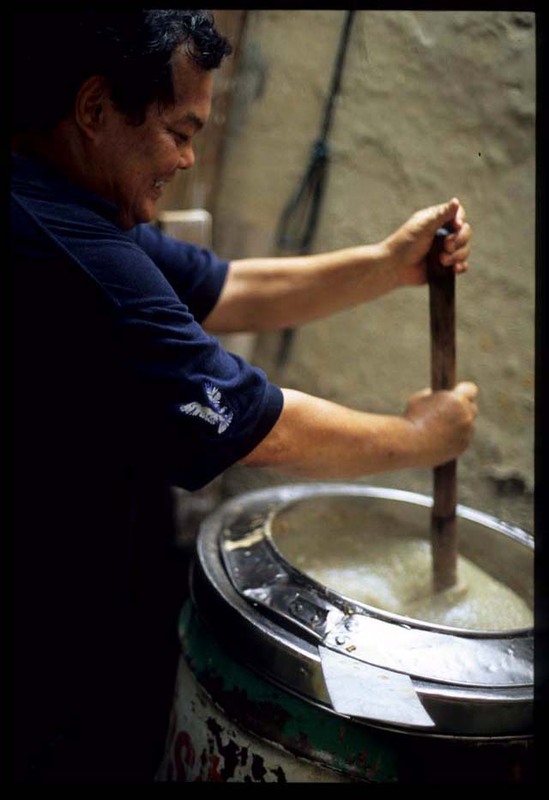 Yut Kee's kaya is made in-house, in a mammoth double boiler fashioned from a thirty-year-old Castrol oil drum; the lid is held in place with an heavy old-fashioned iron from the laundry across the street (now defunct). One batch of the jam, which is made from 300 eggs, 30 kilos of white sugar, and milk from about 68 coconuts, is gently cooked for 18 to 20 hours -- stirred, as Jack says, "whenever we have time". 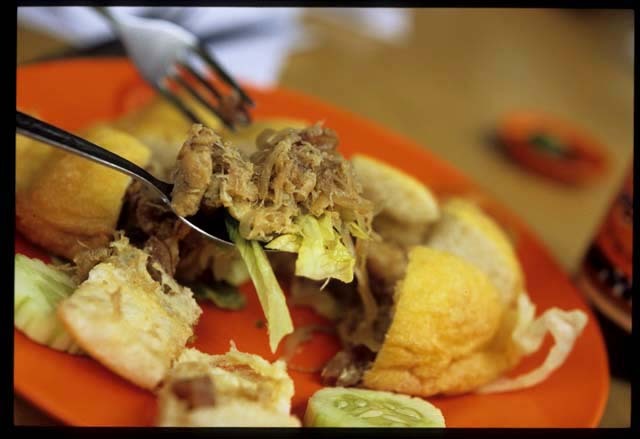 It will fill kaya rolls, cover slices of grilled or steamed bread, and satisfy carry-out customers for about a week. If customer numbers are anything to go by, Yut Kee could well be around for another eighty years. Let's hope so, for it's a welcome respite in a city that, in many respects, has done far too little to preserve its unique Malaysian character. Yut Kee Restaurant, 35 Jalan Dang Wangi. Tel. 03-2698-8108. 8am-5pm, closed Mondays and last Sunday of the month. Public transport: monorail to Dang Wangi stop. Exit the monorail station and turn right, then right up Dang Wangi. Cross the bridge and Yut Kee will be 1 1/2 blocks on your right (about a 10-15 minute walk). The belacan fried rice sure looks charred....nice "wok hei" eh ? great stuff...gotta drop by there again. This is one of the best reasons to be living in the Dang Wangi area :-) I buy their kaya to eat with bread and butter every day. 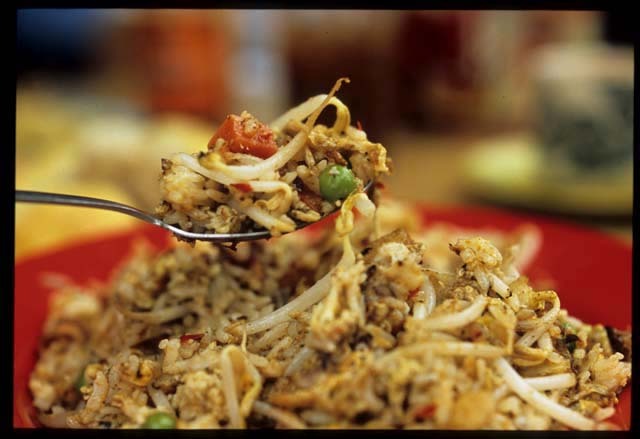 yeah foodcrazee, definately the best, most 'wok hei'd' fried rice I've ever had. Impossible to achieve the same effect at home, it seems. Homemade kaya? Thought that was extinct in KL. Will check it out next time I'm there. 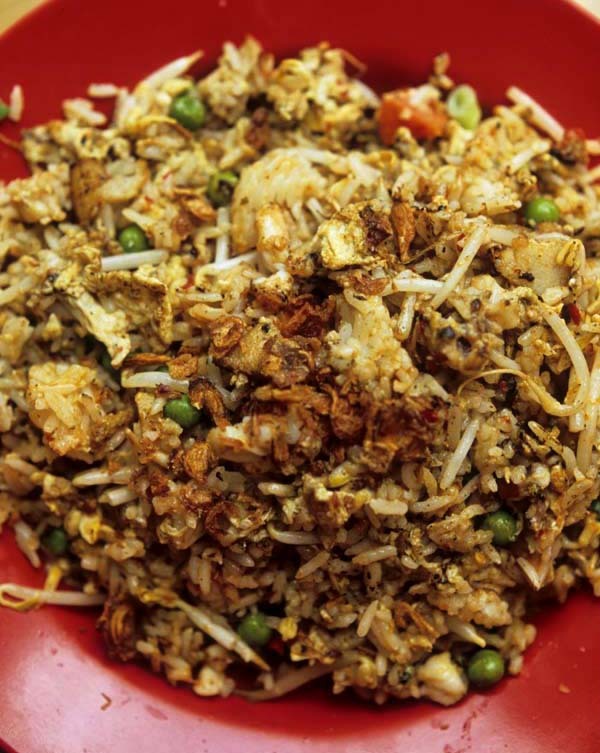 Also the belacan fried rice looks great.